Frustrated because you've tried the prescription acne drugs, the many over-the-counter zit zappers, and you're still bothered by break-outs and pimples? Don't despair. We have a simple, inexpensive way to clear up your skin quickly with one, small daily zinc supplement . You have nothing to lose, but about $6.99 for a bottle of supplements. For those of us who have been there, pimples can seem like the end of the world. Acne has ruined many a date, instantly lowered self-esteem, and for some, lingered on for a number of years, even into adulthood. So, what's so magical about zinc? Let us explain. First of all, we know how important Vitamin A is to healthy skin. 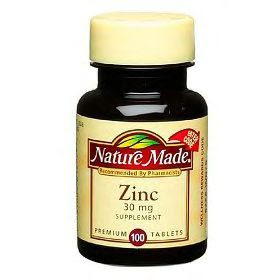 But so is zinc, because it is required to mobilize Vitamin A from the liver to the skin. Several decades ago, a Swedish physician treating a patient for another ailment in the Uppsala University Hospital, noticed that the patient's acne improved after treatment with zinc supplements. A Swedish study was later conducted on patients with pimples in a clinical trial. And after 4 weeks of taking zinc supplements, there were major improvements. After 12 weeks, the patients taking the zinc, showed an 87% improvement in their skin. Zinc is present in a lot of delicious foods we enjoy, like pumpkin seeds, seafood, nuts, dairy products like yogurt and eggs, wholegrain breads, chickpeas, and so on. From the research we found, most experts recommend one 15mg. to 25 mg. supplement pill of zinc daily. We don't want to scare you, but zinc can be toxic at high amounts. Trust us, a little goes a long way. Take the zinc supplement with a meal. On an empty stomach, zinc can make you nauseous. You can find zinc supplements at your local drugstore and in the grocery aisle. That's it: 1 zinc supplement daily, with a meal. Give it about a month, and you should see results. We can honestly say, this worked for us back in our college days. Within a month or so, our skin, and our girlfriend's skin improved greatly. And we were only taking a 15 mg. zinc supplement. After our skin cleared completely, we later stopped taking zinc, and we never had a major case of acne again. Just a reminder: If you are on prescription acne drugs or any kind of oral antibiotic therapy, do not take zinc supplements. Zinc could interfere with the absorption of these meds. Best to check with your dermatologist about the zinc method to clear up skin. Oh wow! I had not heard this before but I will definitely try it! I'm 23 years old and for YEARS I have been saying "Oh, I'm not too worried about my acne..it'll go away when I get older." Well now several years later I still don't have clear skin. Over the years I tried different products without much like. If you tried Zinc and found it beneficial then I feel all the more inspired to give it a shot. It couldn't hurt! Thank you so much for the advice! Nice to see you. I tried zinc at about 15 mg. Just once a day. As I advise here, please take with a meal. It works! I was on it for about a month, when I noticed my skin really clearing up. I probably stayed on it for a few more months. My skin looked great, my friend's too. Then I stopped taking it, and the pimples stayed away. Amazing. But please, never take big amounts of zinc because it can be toxic. Just stay with the 15 mg. Don't go over 25 mg. Be patient. I wish you the best. Good luck!